I feel like I only dabble in licensing my artwork. Dabbling in licensing is sort of an oxymoron or a contraction in itself. You do not dabble in licensing. It is a full time job (as I was often told), full of creating new products, designs and putting them in the correct formats for certain companies. You also need to make contacts, get the correct person (decision maker) to review your artwork. And yesterdays no could be tomorrows yes - so you need to continue to contact companies with new art over and over. At the suggestion of many artists I decided to walk the Surtex show last week. The Stationary Show runs at the same time and right next door at the Javits Center, so it makes sense to walk both shows if you ever do decide to attend one or the other show. Let me just say that not exhibiting at a show this year has been a good thing, I think with the economy in dire straits spending upwards of ten thousand dollars just to exhibit does not make sense for this small company. But if I may contradict myself, when I walk a show, something happens to me, I get a bit depressed and intimidated, but more importantly I start to really wish I was exhibiting. I kick myself for not getting it together to bring my art to the masses. As a newbie licensor (Surtex is a show for artists looking to license their art), and a newbie (read first time walking the show) I have to say I was sort of shocked at how small it was. I was surprised at how reserved it was and quiet. I am used to loud, crowded shows with lots of fanfare and hoopla. I was also overwhelmed by the amount of work that each artist brought to the show. I am considering exhibiting next year, but am a bit overwhelmed (I am repeating myself no?) by the amount of work I would need to bring, and the traffic seemed slow. I have nothing to compare it to, but it did not seem crowded. I saw a lot of beautiful surface designs, but they all sort of meshed together, not one really stood out to me. On a good note though, I was lucky enough to meet one of my favorite artists, and another pioneer in the children's industry. Kelly B. Rightsell and her husband Brian had a booth on the top floor. Kelly's booth was impressive and chatting with her was a highlight of the trip for me. She already has an impressive list of companies she licenses with....I am sure she will have a few more after this show. This is not the first time I met Brian, I have spoken with him at many a show, many a years ago. Darin and I also had the good fortune of speaking with him years ago about the plight of our business. I can honestly say he was very nice, very sincere and gave us the best advice we ever received. I have read in business books, articles and many a blog that exhibiting (or attending ) a big show is not the end of it. You need to make appointments, make calls, make connections - work it sister! You can not just expect to sit in your booth (like the good ol' day) and expect people to come in. I agree 1/2 of the work before going or exhibiting at a big show is making appointments. I am not a big believer in motivational speakers, but the old "You are in charge of your own destiny" could not be MORE true than when going to a show. Which brings me to a great (or inspirational) story I was told by an entrepreneur. A very, very successful one too (I know famous people, really I do!) This woman called up a HUGE company and she said, "Hey! Why aren't we working together? Here, go to my website, my designs should be on YOUR products. " Next thing you know the top sales representative comes to her office, they write up a contract and her designs are on this "product" all over the darn country. A huge license and a major perk for her. Now, I am not so naive to not think she probably called 47 other times and did not get the same response, or she spoke to 345 wrong people before she got the "right" one on the phone. Or, maybe it is true and she was at the right place at the right time - who knows. The point is she makes things happen, she is not afraid to make the call either. I have to respect that, unless I get overwhelmed or something, right? You are my eyes and ears out there! Thank you for the great report...I hope you have fabulous success when you exhibit. Love your ceramics and all of your other things! Your style is similar to my giftware stuff. 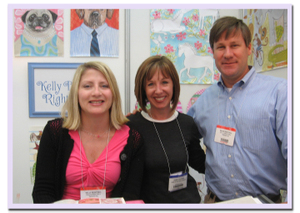 So---are you going to Surtex this year? I went in 2007, took some seminars and just walked the floor. My goal was to go back this year(2009)and exhibit, but have had a hard time getting help from the contacts I made. I am just now finding my true direction. Maybe I'll be able to do it in 2010! Please come check out my blog!